Splendent Media is a Los Angeles-based film and television production company founded in 2010 by Sakiko Yamada. 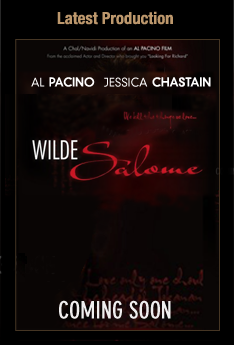 The company quickly landed its first project, the Al Pacino-directed feature film Wilde Salome, on which Sakiko served as an executive producer. A reimagining of Oscar Wilde's acclaimed and controversial stage play "Salome," starring Academy Award®-winner Pacino, Academy Award® Nominee Jessica Chastain (The Help/Zero Dark Thirty) and Oscar®-winner Estelle Parsons (Bonnie and Clyde), had its world premiere at the Venice Film Festival in 2011 Salome and Wilde Salome London premier was held at the BFI on the 21st September. The company has several feature film and television projects in various stages of development and production. Sakiko Yamada is a private investor and the founder/CEO of the Splendent Group. Splendent Media was founded in 2010. As a principal, she overseas all of the company’s development and production activities. She is also an executive producer of the Al Pacino-directed feature film Wilde Salome which won the Jeager LeCoultre Glory to the Filmmaker Award at the Venice Film Festival in 2011. Before starting her entertainment industry career, she has headed private real estate investment company Land and Land, for which she continues to serve as a President and Chief Executive Officer. For her extensive humanitarian efforts, she was named as a Veuve Clicquot “Woman of Influence” in 2010 by LVMH. She was the youngest Advisory Board Member for St. Vincent’s “Meals on Wheels” Los Angeles, one of the country’s largest privately-funded charity organizations. She also served as a committee member and protocol consultant for various charity events hosted by Sir Richard Branson and his mother Eve Branson in conjunction with Virgin Unite, the entrepreneurial foundation of the Virgin Group. In addition, she served as a member of the Board of Governors of the Japan America Society of Southern California, a non-profit educational organization founded in 1909 to build economic, cultural, governmental and personal relationships between the people of Japan and America. In addition, as a Founding Board Member of the International Academy of Gastronomy, U.S. West Chapter, Sakiko promotes the safeguarding and development of regional and national cultures and their culinary heritage with Unite Nation (FAO). In 2011 she was appointed to serve as founding President of the International Academy of Gastronomy of Japan, the first official Academy in all of Asia. This Academy has chosen as one of the expert organizations for the Cabinet Office’s Cool Japan Projects. She is a member of Culture Vision Summit for the 2020 Olympics in Tokyo and she has given some lectures in 2017 to the Liberal Democrat Party how to promote and brand Japanese Culture to the world. She is a member of the Foreign Correspondents Club of Japan, a member of the Charter Institute of Public Relations and certified as a Protocol Officer by the Protocol School of Washington®. She was born and raised in Tokyo, where she graduated from University of the Sacred Heart and has spent 18 years in Los Angeles, London and Singapore.